HighTouch: Who is sending traffic to video sites? Who is sending traffic to video sites? 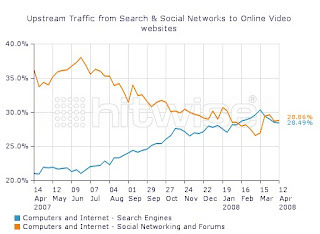 It's obvious that search is on a trajectory that will soon surpass social. Some of this must be due to improvements in video metadata allowing it to be more easily found? Universal search might be another factor? I have to admit, however, that I'm mostly confused by this graph. A plausible explanation escapes me. Translation: This isn't what I would expect to see. Ideas? In the big scheme of things, very few people (as a percentage of Internet users) actively use social networks. Once search is able to serve up video content relevant to search terms, it's inevitable that it will surpass social networks' impact. However, social networks do drive the memes (for now), since the memes get defined by those who use social networks.